Amanda Pearson, a Quaker woman suffering from a broken engagement, leaves her home in New York and travels West to minister to the Nez Perce Indians. Along the way, she encounters many problems, yet she never gives up. Like a true woman of courage, Amanda trusts God to see her through, even when she fights illness, abandonment, misunderstandings, and an unexpected event. Set in 1837, this historical novel has many twists and turns that will take readers from the rugged Rocky Mountains to Oregon Territory and the home of the Spalding Mission, where the Nez Perce Indians were first introduced to Christianity. Take a three-thousand-mile journey with Amanda Pearson as she joins the work at a Quaker mission. Then read the newly-written sequel about Little Fawn. It was during a time when my husband and I lived in Idaho, not far from Lapwai, that I began to research the Nez Perce Indians and how Rev. and Mrs. Spalding started the first mission there. I was interested in the fact that several years prior to the Spaldings' arrival, a delegation of Nez Perce had gone to St. Louis, MO on a quest to find out more about the Book of Heaven (the Bible) and ask for missionaries to come to them. Although the story of Amanda Pearson, my Quaker heroine in the story, is purely fiction, the details I incorporated into the book about traveling through the mountains and the things she had to deal with are based on facts I learned while researching. 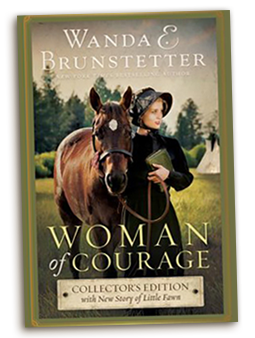 "As a fan of Wanda Brunstetter, I can easily say this is probably my favorite book by far. Historical fiction fans will enjoy this story, but anyone who is looking for a faith-based read, where romantic feelings slowly develop, interesting characters, and more than a few twists will find this one to their liking as well." "I have read many books by this author and have never been disappointed. This book is no exception. Although it is a departure from the Amish genre she normally writes, it is every bit as good and exciting as her Amish books." 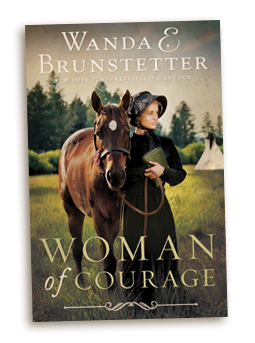 "Woman of Courage really shows how talented Wanda Brunstetter is and why she is so popular. I think this novel is probably one of her better works. I loved the character of Amanda. What a strong and fascinating woman!"